A large range of cardboard food containers, the majority of which can be recycled as all are made from food grade card. A great green alternative to the traditional offerings of plastic or foil containers. 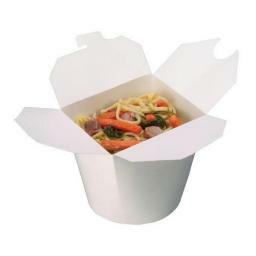 Our noodle boxes are lined, and will happily contain a wet curry or noodle dish. Sizes range from 16oz - 32oz in plain and patterned styles. These products are leak and grease resistant, microwaveable, stackable, and are easy to use. Our boxes will easily hold hot, cold, wet, or dry foods. Most importantly, Our packaging will keep food fresh for your customers.